A joint session of the governments of Kosovo and Albania has raised the spectrum of Greater Albania, a nationalistic project rejected by the EU, the US and the wider international community. Albania on Monday (26 November) lent support to Kosovo’s 100% tariff on Serbian goods, which Pristina levied last week in retaliation for what it said were Belgrade’s efforts to undermine it on the world stage. Kosovo on 21 November raised customs tariffs on Serbian and Bosnian goods from 10 to 100% after Serbia blocked its former province from joining Interpol, the international police organisation. The European Union condemned the tariff, while Serbia’s president has said it amounts to a de facto trade ban. He was speaking to the press in the western Kosovo town of Peć (also known as Peja), where the two governments met to sign a deal to eliminate trade barriers on their border by mid-2019. 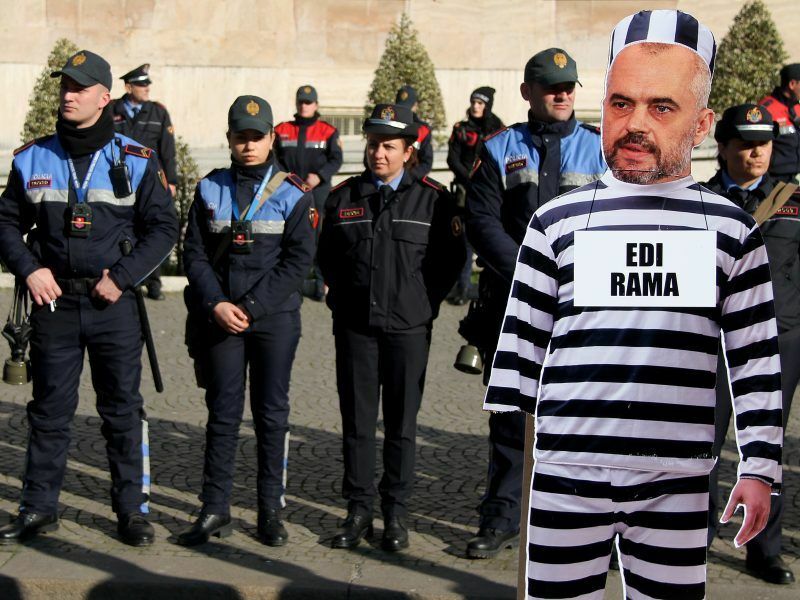 “Today is the time to set 100% tariffs in the north and to have zero tariffs in the south of Kosovo,” Rama said. 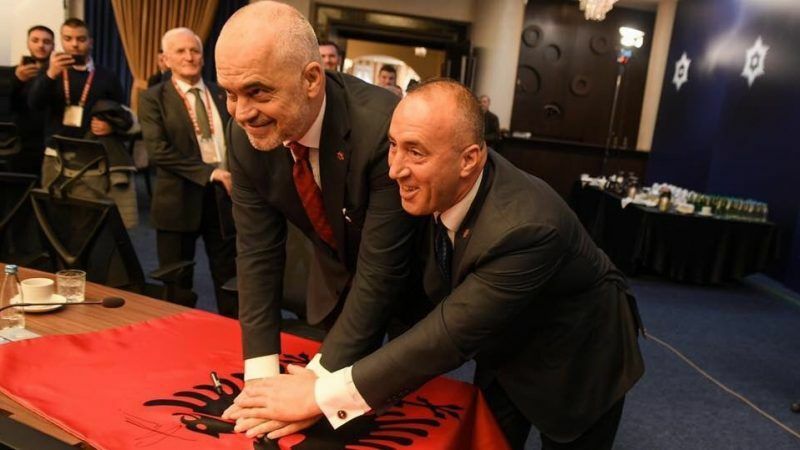 Rama posted on his Twitter account a photo with Kosovar politician Fatmir Limajn, with whom they make the sign of the Albanian eagle, a symbol of Greater Albania. Other twitter posts show the entire Albanian and Kosovar delegations making the same sign. Albania is a key ally of Kosovo, a former Serbian province with an ethnic Albanian majority that has struggled to gain full global recognition of the independence it unilaterally declared in 2008, a decade after breaking away in a brutal war. Serbia refuses to recognise Kosovo’s independence and has accused the pair of wanting to unite and form a “Greater Albania”. At the meeting on Monday, Kosovo and Albania also announced the end of roaming charges on mobile phones used by their citizens. The EU and the US have warned Albania to avoid “careless language” after its prime minister suggested a single president and single security policy for both his country and neighbouring Kosovo in a speech that infuriated Serbia. The United States urged Albania yesterday (21 February) to avoid “careless language” after its prime minister suggested a single president and single security policy for both his country and neighbouring Kosovo in a speech that infuriated Serbia. Albanian what?!! The country is in perils of ending up like “Colombia” or either “Venezuela” in the heart of Europe!! It’s a kleptocratic narco-traffic state with politicians deploying criminals or involved in organised crime! The international factor has to convince that people have their right to protest for a better country!!!! Otherwise, by protecting it the EU will only incentivise a narco-traffic country and only lose its credibility! !